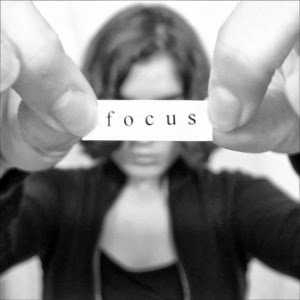 My DBT Life: Bring the focus in a little on...you! Don't let it alarm you! I know that focusing on yourself can seemingly feel unnerving. I mean after-all, isn't that what you have been doing for some time now? Isn't all this therapy, maybe medications, groups, research etc part of focusing all on you? To a degree, yes. However, that isn't what I am referencing here. I always consider myself to be "under-construction" - so I don't see a time that I won't be reaching out for skills or to learn something new about myself. 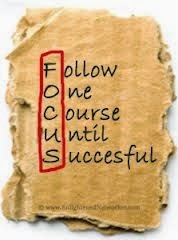 However, there is a different kind of focus. This kind is of the self-assessment variety. Or self-discovery. I am doing the best that I can and I need to do better. I am doing the best that I can but I need to do better. "But" generally when spoken negates what was said before it. So, believe it or not when spoken that way, out loud or internally, you have removed the basic laws of dialectical behavioral therapy. You have negated the existence of one of the items. Which is it? Am I doing the best I can or do I need to do better? I assure you, in reality, they both exist. It is a balancing if you will. Most every one of us can attest to having witnessed a conflict by two other people, you as the third person (outside of the conflict) were able to see at least a nugget of truth from both person's perspective, yes? That is the entire concept of a mediator is it not? Well, that same principle applies to you and your reality. The use of and instead of but allows for those two opposites or opposing ideas to exist at the same time, you are essentially accepting that there is at very least a nugget of truth on each side, usually there is more than a nugget, I am sure you can all agree to that. How about this though, those two sides, those two opposites are existing not only with you and those around you, they are also existing with-in you. Yes, you...this is where you need to focus on you. Your interaction with the world around you and how you cope with your mental illness will improve as you balance yourself, inside. Balancing or an equalizing of the opposites that exist inside of you. So any given situation in your life you are going to have certain parts emotion, certain part logic. Say, I am having a stressful day and I am off baseline a bit and I know I have to make a deposit in the bank or my account will be overdrawn. What it will take me to get out of the house will be emotional. 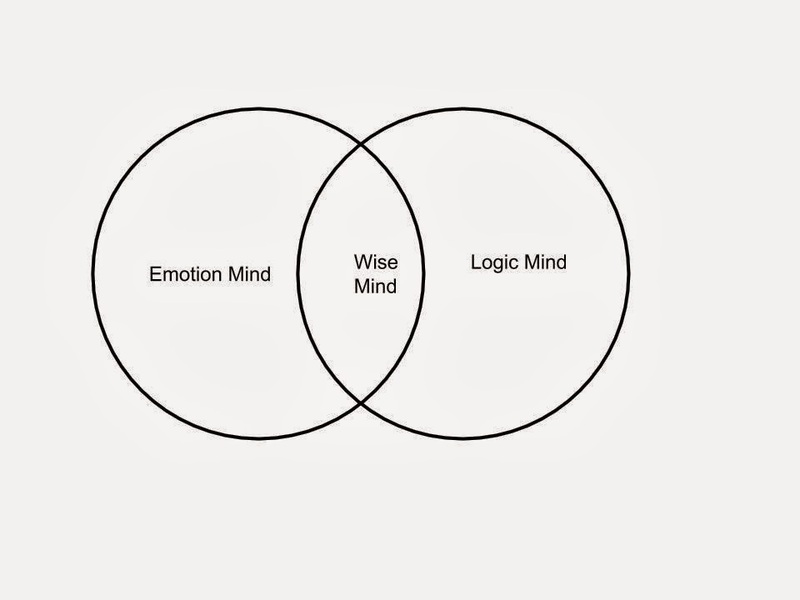 Now, do I listen to my logic mind and reason that it needs to be done so I grab some skills and balance the logic of the need with the emotions of being off baseline in order to make a wise mind decision and go and make the deposit? Or do I allow my emotion mind to reign and I allow the over-draft? Or another scenario, do I ignore my emotions regarding my being off baseline and let logic rule, and make the deposit without considering the need for skills and risk a melt-down out in public that will likely incur target behavior that I will later regret? Perhaps I am too off of baseline to risk leaving the house and making that deposit so I balance both logic and emotion and accept that I am incapable of doing it on my own and I call a friend for help, that also would be a wise mind decision. Then of course the extreme, if I am bordering target behavior maybe the wise mind choice would be to allow the over-draft. Just because it isn't ideal does not make it a wrong choice. I ask you though, without focusing on your needs, where you are currently, what your honest self-assessment has told you, how can you possibly be making choices from your wise mind? How will you know when you need to balance two opposites? Let's take a step back for a moment and remind ourselves of something here, the reason the reality is that you are in fact doing the best that you can and you also need to do better is because you arrived at this point in your life by events that were perfectly caused. Now, before anyone leaves, vowing to never return here, hear me out. I am not saying what has happened to you in your past is perfect, right or fair. I am saying that your mental illness, or that of a loved one, has been perfectly caused, or in-other-words, it makes perfect sense how you arrived (or your loved one) at this current destination here today, in this moment. Accepting that without those events, or without the chemical imbalance, you would likely not have been diagnosed with a mental illness, you would likely not have been introduced to DBT, you would likely not have been intrigued to search the internet on such subjects and you would likely not have found yourself sitting here right now, reading this. 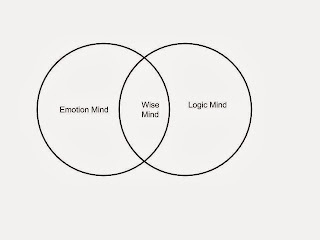 So understanding that you are here for reasons that make sense (again, not fair or right) you can start to see why balancing two opposites within you is paramount to reaching your goals of living a life worth living.The only way we reach that balancing is by understanding our 3 minds and how they work together, even when they are producing feelings, thoughts, actions, and emotions that are opposite. I am asking if we can get a dialogue: Why is this quote connected to focusing on ourselves and our 3 minds?